Wednesday afternoon, supposed polling genius Nate Silver tweeted that "Turnout was down from 2010 in almost every state." Readers will notice that the map contains 13 plus signs in "states with at least one statewide candidate (for Governor or Senator) in both years," specifically (roughly from West to East) AK, MT, CO, NE, KS, IA, AR, WI, KY, FL, NC, NH and ME. That's about 30 percent of the roughly 43 states involved in the analysis. Last time I checked, 30 percent is not "almost every." Astute readers will also note that 11 of the 13 states with turnout increases had a competitive race for the U.S. Senate, the governor's office, or both. The exceptions are MT and NE. 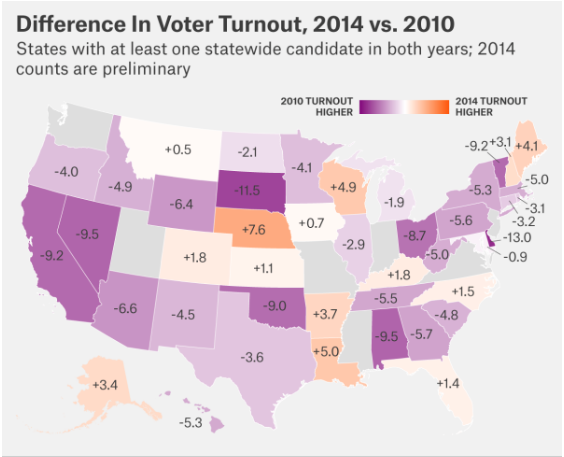 Most states where turnout crashed did not have competitive statewide races. The exceptions — where turnout fell in competitive situations — were IL, MD, CT, RI, MA and GA. Five of those six are considered blue states. Silver is claiming that more voters than four years ago didn't care enough to show up. He's mostly wrong about competitive red and purple states, and mostly right about competitive blue ones. In lazily and wrongly contending that "almost every" state saw a turnout decline, he is trying to minimize the significance of Tuesday's Republican gains. I would say "Nice try, Nate" — but it's not even that.